Healthy easter chocolate recipes that are nutrient dense, have vitamins, contain fibre, high in protein and heart-healthy fats. The great thing about low sugar healthy easter chocolate is it’s much harder to overeat as they are filling and satisfying. All healthy easter chocolate recipes are vegan, gluten-free, all natural, made from whole ingredients and suitable for a plant-based whole foods diet. These vegan easter eggs are like a common cashew cheesecake in a chocolate shell. Although let me tell you 15 years ago when I was making cashew cheesecakes I regularly got laughed at. It still seems bizarre for them to commonplace these days. Also, it’s a handy reminder to keep innovating! The yolk in cashew cream eggs is naturally dyed with turmeric. You don’t taste it but it adds some nutrition and just a pinch gives a bright colour. Some vegans won’t like that this resembles eggs, I understand that but for many people they do want to replicate a Cadbury’s cream egg. Even if you aren’t vegan I would avoid the aftermentioned cream egg due to the chocolate containing palm oil. I would like to say these candies were made on purpose to resemble bunny poo. But honestly, it was an unfortunate mistake as I’ve never had a pet rabbit. The video has now received almost 2 million views and hopefully, they aren’t all from people laughing or sharing because of how awful they look. This is a great easy, cheap and delicious recipe to make from just chocolate and chickpeas. 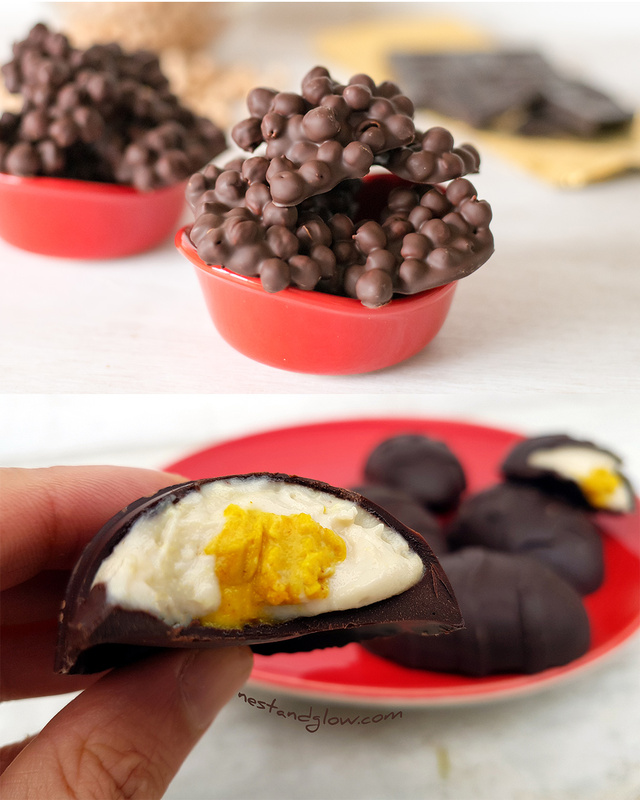 Similar to the fondant cashew cream egg but with a shot of espresso for a rich coffee taste. I have to admit I didn’t make this recipe with real coffee or espresso as I’m not a huge fan. I made it instead with chicory coffee but I’m reliably informed that it works well with real espresso. These were made as whole eggs and as you can see it did get a bit messy but in a delicious kind of way. I would recommend making in half eggs like the cashew cream eggs as the top layer of chocolate makes it easy to make a neat clean egg. Even if you’re quite a messy cook like me. Freshly roasted peanuts mixed with chocolate are really easy to make and everyone loves these chocolate peanut bites. I really didn’t learn my lesson with the chocolate chickpeas and this time made it one step worse by shooting in the garden against grass! I was just excited that it was sunny and warm so could shoot food against green grass as that’s my favourite backdrop. The cashew nuts help to give the chocolates a creamy taste despite being dairy free. Does having green and chocolate count as a easter chocolate? I like to think so, but maybe I’m biased as I love this recipe. So easy to make and quite inexpensive as it’s nut free. I’m trying to eat more seeds as it’s so easy to eat way too many nuts on a plant-based diet! Have you tried any of these? What did you think and did you adapt them? Let me know in the comments below or on my YouTube channel. Have a great Easter!